This week, poet Holly Parsons and sound engineer John Mahoney of Raven Audiobooks began recording an audiobook version of What Is Healing? Awaken Your Intuitive Power for Health and Happiness. In about six to eight weeks, you will be able to download the audio file through www.itunes.com or www.audible.com or www.amazon.com and my webstore at www.shop.totalfitness.net in order to listen on your smart phone, ipad or computer. John sent me voice samples for three potential readers. Holly Parsons was the first voice I listened to and I knew she had to be the one. I knew immediately that Holly was the best possible reader because she spoke directly from her heart. As we were all preparing for the audiobook to be made, I ordered Holly’s latest book of poems, Soul of a Woman: A Poetic Journey in Love and Life. A lot of major events happened this week. Two brothers blew up the Boston marathon. The azaleas opposite my studio blossomed. The iris opened in my front garden. Gabe Horrisberger dug up the remaining weeds in my back garden and set out all different kinds of lettuce, spinach, celery, ferns, sedums and ajuga. My purple perennial orchid opened completely, a great source of delight for me as I have always had so much success with my indoor orchids and decided to be brave and try one outdoors. Even though I was deeply distraught, like most Americans, by the events unfolding in Boston, one step into my garden would shift my energy immediately. I felt like I was in another world altogether – radiant, peaceful, teaming with songbirds. It took so long to receive Holly’s book of poems that I had just registered a complaint with www.amazon.com yesterday, only to discover that the problem was I had been too busy to go to the mailbox and find her beautiful book. Everyone needs a method – or several methods – of being able to shift our vibration. We can all get confused, overwhelmed, fatigued, disheartened. One of the simplest methods in natural holistic medicine is to pay attention, notice when your thoughts are going negative and take action to find the best possible thoughts and feelings inside yourself. 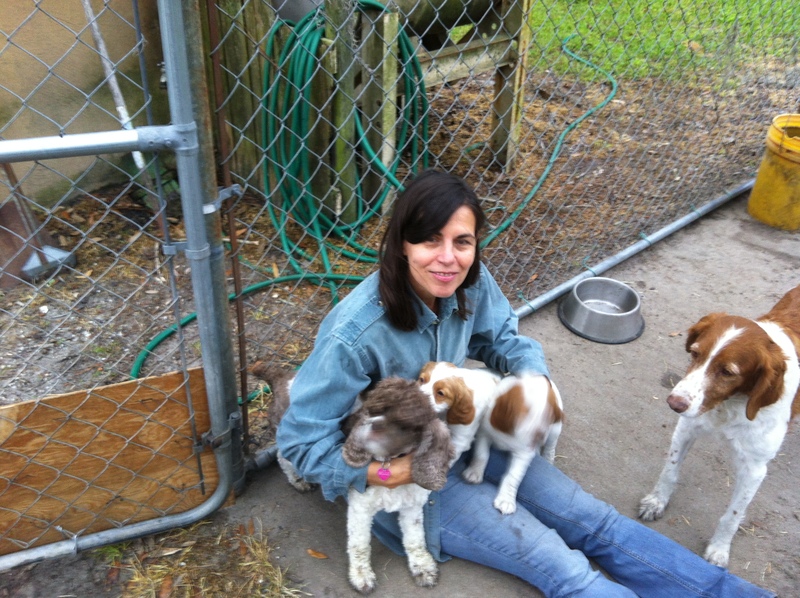 Last weekend, visiting my family in Savannah, Georgia, and Hardeeville, South Carolina, all it took for me to shift into a state of pure bliss was to play with four-week old puppies from Snap, a Brittany spaniel owned by our family friend Floyd Robbins. You can gaze upon a fresh flower in your own garden or you can order Holly’s beautiful book, crack it open at any point and find yourself instantly uplifted. You can read more about Holly and her poems at her website.